Reporting to the Health and Safety Manager, you will be part of a fast paced and passionate environment focusing on supporting critical day-to-day operations and delivering on key projects. This full-time role is key to the Followmont network and would suit a motivated and enthusiastic professional with demonstrated problem solving and time management skills. An overall passion towards the service we provide our customers and the promotion of unity within in our people is a must. Followmont Transport is a large family owned business established in 1983. 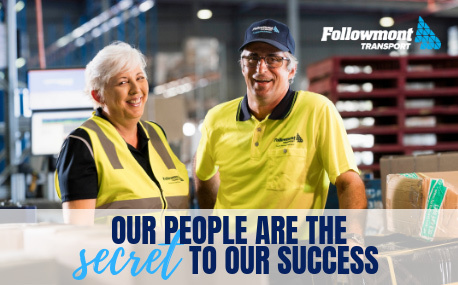 Today Followmont Transport employs over 600 staff, utilises the service of over 150 subcontractors, and owns and operates a 600+ vehicle fleet throughout Queensland. Followmont Transport’s primary business is providing general freight services throughout Queensland and Northern NSW. Followmont Transport is an equal opportunity employer. In return we will offer you a great working environment, flexible work conditions, internal training, career development and other opportunities, whilst being part of a growing business which is currently preparing for its next stage of growth! If you encompass the above attributes and feel this position is a good fit for you, the Followmont Team would love to hear from you!